1. SEARCH PACKAGES : Select City, Programme type (General, Low Fare and Moyassur, Nafrah (Leaving Mina on 12 (Mutajil), Leaving Mina on 13 (Mutakhir)), Enter image code and click on search. - You can now see various companies packages about from 601 companies, You can refer the one which suits you by clicking on "Details" for more information. 3. SAVE THE WISHLIST : Add it as your favorite package or add companions. 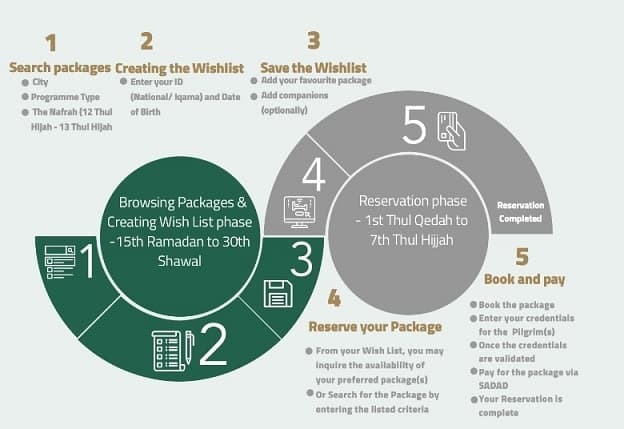 For now only browsing packages and creating or adding to your wishlists are allowed from 15th Ramadan to 30th Shawwal. Reservation of packages will start from 1st Dul Qaidah to 7th Zul Hajj. 5. BOOK AND PAY : Book the package, Enter your credentials of the Pilgrims, Once the credentials are validated, Pay the package money via SADAD, After this your reservation is complete.